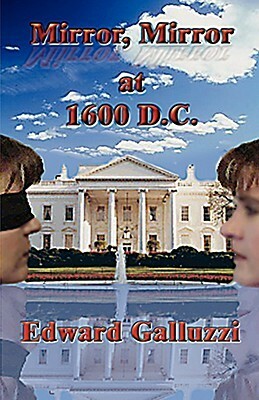 Mirror, Mirror at 1600 D.C.
Mirror, Mirror at 1600 D.C. is an enticing book shrouded with romance and mystery. When a mysterious man named Harrison Rossetti is in Rome working for the US government, he has a chance encounter with journalist Hannah Littleton. Their lives are changed forever as an unexpected love blooms. While preparing for their wedding, Harrison is called away for a top secret project leaving Hannah alone with her fears. Harrison is then swept away in an unexpected, dire situation. Life or death decisions are made at every turn. The country’s security and future are at stake. Meanwhile, Hannah befriends Harrison’s longtime friend, Pope Josetta; unfortunately, under some less than desirable circumstances. Follow the unexpected twists and turns of this mind – catching novel. Edward Galluzzi leaves you on the edge of your seat. His use of imagery and vocabulary captivates the audience and places them directly in the hair tingling situations. Friendship, Love, Sacrifice and Duty are all highlighted within these pages. While Harrison is portrayed as a secretive man, it is evident that he is a loyal companion once you break through his shell. He is committed to the people he truly cares about. The use of friendship adds an additional dimension to the story line. You find yourself feeling for these unexpected friends. The story of Harrison and Josetta, for example, leave a sense of awe and respect. The relationship between Greg and Harrison tiptoes on the line of professionalism and friendship. This leaves the reader questioning the next move from each. Love sets an undertone throughout the story. Galluzzi does an exceptional job at catching the hearts of readers and leaving them longing for their own Harrison and Hannah love story. My heart ached for the lovers amidst their separation. While the love is admirable, it can reach peaks that I wish would dive a little deeper, at times you find yourself absorbed in a passionate moment eagerly awaiting the next move only to be left hanging. Sacrifices must be made, especially in Harrison’s line of duty. Sometimes, ones that break your heart and leave you feeling empty. I do wish some of Hannah’s fears and doubts would have been expressed and explained a little deeper. Harrison’s emotional responses to such sacrifices were held on the delicate balance described in ways that rendered the reader sympathetic. The sense of duty is noble. All sacrifices were made in the wake of duty and respect. An empowering sense of patriotism coupled with disbelief on just how far someone might be willing to go in the name duty continually engulfs the reader. As stated previously, the twists and turns of this novel keep the reader consumed. The mind is constantly trying to skip to the next scene to find out what happens. I personally found it to be a quick read simply because I had to know what happened next.